So why do we act as though we are ignorant? Because that inner innate wisdom–called Prajna–P-R-A-J-N-A–is covered up. The Vashanas–habit energies–so cover the Prajna that it becomes impossible to shine thru to the conscious mind–but it is there. 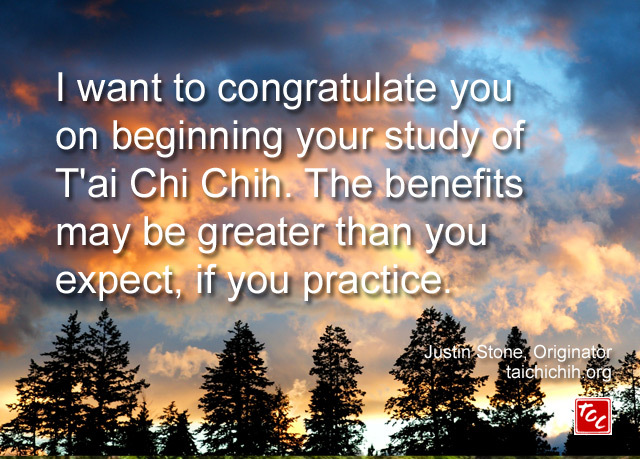 Most people who come for T”ai Chi Chih lessons do it for physical reasons, either because of ailments or because they feel it will help them in the areas of energy, hypertension, etc. Thus, they think of TCC practice as a form of therapy, which it undoubtedly is. However, they may later find that they have derived much deeper– Spiritual–benefits, which they did not expect. I have stayed with Yogis, in the Himalayan Foothills, who are masters of Prana, the Sanskrit word of CHI. They seem to be impervious to the cold and hunger. Since we ate only once a day, about ten-thirty in the morning (which was not enough for me), one would expect an eagerness to get to meals. However, such was not the case. One time I asked my friend, Mararaj, why he was not at the meal that morning. He replied that he had been meditating. On my recent visit to Albuquerque I gave a talk to over 200 people on the subject “The Spiritual Life” (in a busy world). Many points were similar to the “merging Sense with Essence” talk I made to teachers at the Minneapolis Conference. This subject seems to hit people hard, as they feel they must get away from family and work routine in order to practice Spirituality (accordance with the Real). Teachers and students are constantly asking me to write a book on ‘Ultimate Truth’. If I did so, they would resent the very ‘truth’ they asked for, as it would threaten the ground of their previous concepts. And “ultimate truth” is of no value in everyday life. In speaking or writing about Vashanas, it is easy to give the impression that they are something “bad.” Actually, these “habit energies” are neither good nor bad. It is impossible to live everyday life without building such habit energies.